The Jewish Colonial Trust (JCT) was incorporated in London by Theodore Herzl on March 20, 1899 as a financial instrument for the Zionist movement. It had an interesting background of which further details can be gleaned from the on-line Jewish Encyclopedia. Acquisition of the permit for settling in Palestine during the Ottoman Rule. Provision of credit for the establishment of a Zionist enterprise in Palestine . The JCT was the parent company of the Anglo Palestine Bank which also established several subsidiaries such as the subsequent Bank Leumi Le-Israel. An interesting aspect of the shares was that if one were to look at a listing of those involved in the JCT, as expressed on the back of the share certificate, there were none from Lithuania . This is peculiar as Litvaks were some of the most ardent supporters of Zionism and Palestine . Dr. Th. 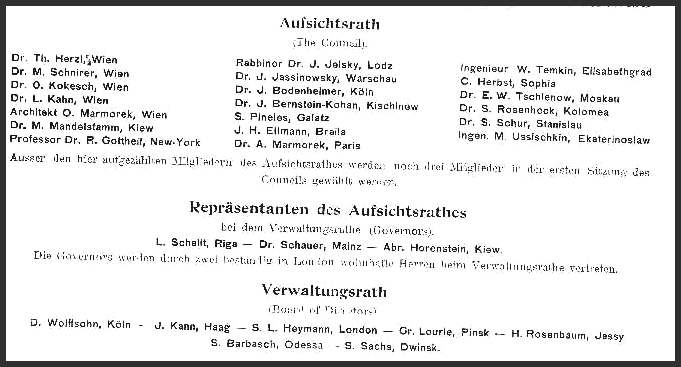 Herzl, Wien; Dr. M. Schnirer, Wien; Dr. O. Kokesch, Wien; Dr. L. Kahn, Wien; Architekt O. Marmorek, Wien; Dr. M. Mandelstamm, Kiew; Professor Dr. R. Gottheil, New York; Rabbino Dr. J. Jelsky, Lodz; Dr. J. Jassinowsky, Warschau; Dr. J. Bodenheimer, Koln; Dr. J. Bernstein-Kohan, Kischinow; S. Pineles, Galatz; J.H. Ellmann, Braila; Dr. A. Marmorek, Paris; Ingenieur W. Temkin, Elisabethgrad; C. Herbst, Sophia; Dr. E.W. Tschlenow, Moskau; Dr. S. Rosenhock, Kolomea; Dr. S. Schur, Stanislau; and Ingen. M. Ussischkin, Ekaterinoslaw. The Governors were: L. Schalit, Riga ; Dr. Schauer, Mainz ; and Abr. Horenstein, Kiew, and the Board of Directors were: D. Wolffsohn, Koln; J. Kann, Haag; S.L. Heymann, London ; Gr. Lourie, Pinsk ; H. Rosenbaum, Jassy; S. Barbasch, Odessa; and S. Sachs, Dwinsk. Chicago , June 12 � The local officers of the Order of Knights of Zion have received official notification from the Jewish Colonial Bank of London that the number of shareholders of that institution has reached 100,000; that the number of shares necessary to go to allotment has already been subscribed, and that the Jewish Colonial Trust will proceed to make an allotment the moment the list of subscribers is perfected. The Jews of Chicago have thus far subscribed for 2,000 shares, each $5 par value. The Union National Bank of Chicago represents the Jewish Colonial Trust in the United States , and the news from London will give an additional impetus to the movement here and in this part of the country. Jewish Shares Shut out of Russia: Harmless Souvenirs of the Zionist Movement Taken for Documents of Propaganda. St. Petersburg , Oct. 16. � The Russian Minister of Finance has forbidden the shares of the Jewish Colonial Trust to be bought and sold in Russia . The concern has a capital of $10,000,000 and 130,000 shareholders. Among the schemes which the Jewish Colonial Trust is prosecuting is one for the purchase of land in Palestine . In support of this scheme the trust has issued an enormous number of stamps, something like postage stamps, which are printed in Vienna , and are sold in large numbers to the supporters of the movement. They are merely souvenirs sold at the value of the smallest coin in each country, and there is printed on them in Hebrew characters only the word �st1:City w:st="on"> Zion �. The Russian authorities, however, having come across these stamps in the post, seem to have suspected that they hid some political plot, and were in the nature of a secret propaganda. Therefore, to be on the safe side, they have prohibited the introduction of any of the documents issued by the society. It is interesting to note that the Russian Minister of Finance, at that time, was Count Sergei Witte whose second wife, whom he married in 1892, was a converted Jewish divorcee, Matilda Ivanovna Nourok Lisanevich. Nurok, of course, is a well-known Litvak Jewish name. The prohibition by Count Witte against the shares, however, did not stop the propagation of the shares and they continued to be purchased by Jews everywhere. Due to the deaths during the Holocaust of so many of the shareholders, the shares or monies left by them were transferred during the 1950抯 to Otzar Hityashvut Hayehudim LTD or the Jewish Colonial Trust Limited. In 2006, Israeli parliamentary inquiries produced a new company called the Company for Location and Restitution of Holocaust Victims Assets LTD. This company allowed for the entitled heirs of the original shareholders to redeem the shares provided they had proof of entitlement. A site was established on the Internet to enable heirs to claim their payout. It is from this site that the listing of Rokiskis shareholders was extracted. It is possible that there were other Rokiskis people listed under different places as many had already left Rokiskis and gone to America , South Africa , and South America . In addition, there are many individuals listed under Lithuania only and not by town and some are not even listed by country. An example of this is Mordechai Bedil who had a deposit and no other information was given. The best thing to do is to go to the site and plug in your family name and see what pops up. Remember that there may be many different spellings of your family name as well as misspellings. Also, if you sort the database by country, an example being Lithuania, you will find that a substantial amount of the names were input in Hebrew and were not translated into English.